This entry was posted on Saturday, May 26th, 2012 by Frances Ryan. I’ve been quiet again. (Still?) So I feel that I should pop in and say hello, since so often I’m quiet when life is hard and I’m feeling down. But that’s not the case right now. Well, mostly not the case. Anyhow, since I’m not really in a position to share the interesting-ness of the last couple of weeks (yet) I’m just checking in to say that life is mostly good right now. I am busy working on my dissertation and am filling out job applications like a mad woman. I had a platelet count last week and the results came back at 164. Yes folks, that’s in the normal range. Awesome! I am running the Edinburgh Half Marathon tomorrow. Only I didn’t get registered in time, which means I’m running as someone else, since they kindly sacrificed their entry for me. Anyhow, I expect that the next couple of weeks will be weird and filled with more mulling. (And job applications.) But I’ll try not to be too quiet. Glad that your platelet count is awesome and that you’re feeling healthy and happy! Good luck with the race…I am in awe of you! I did a great big happy dance about your platelet count…plenty of room in the kitchen for that! 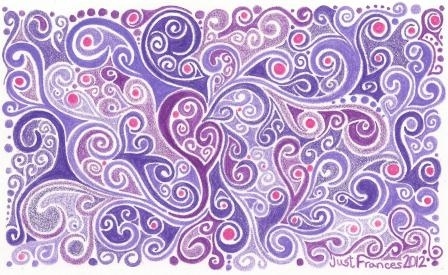 I love, love, love the swirl drawing you made for K. I know she’ll be so happy to receive it. Good luck on the run. Thanks, both! I am really happy about the platelets. I know they may (and most likely will) drop but as long as they only drop back to my level of normal that’s OK! Race was good. Life is (still) good. And I hope the good stuff continues!